The Zexum Cable Dispenser Roller is ideal for the storing and dispensing drums of cable for warehouse and vans or for cable and wire preparation. Manufactured to last from durable, corrosion resistant powder coated steel. 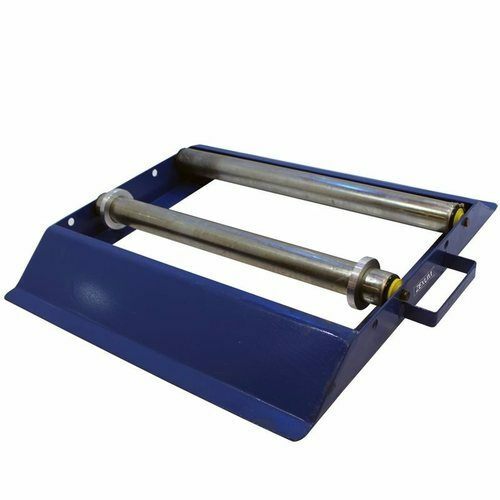 The spring loaded adjustable rollers securely hold different cable drum sizes and it has clamps to prevent sideways movement. Rolling heavy industrial cables is made simple with twin steel rollers. Lightweight and portable, this units measurements are 620mm(length) x 620mm(width) x 55mm(height) and weighing only 11kgs. The unit has a maximum drum width of 580mm and weight capacity of 320 kg (larger drum weight capacity available on application). Super product, bought one to try and make sure it was what we required in our business... have bought another 4! I bought this based on the picture to reel off some fire alarm cable which it does just fine but the adjustable discs which hold the cable drum on the rollers and the unit itself are great. I have used this to reel of massive drums of wire armored now. Really impressed with this simple but effective kit. Hello, can i put 100 meters of 16mm swa on this? Electrical World Replies: yes this should be fine - 16mm 3 core swa is approx 1kg per meter + the weight of the drum i would estimate comes in at 30kg . Total weight would be around 130kg. The dispenser is designed to take up to 320kg in total.